This seems to be my MO with sample stands. 1) I shamelessly mosey over 2) I engage by asking a question, like “what is this” 3) I secure the free sample (bonus points if you “grab one for your boyfriend” wink wink). 4) I pick up the product bag and act like I’m interested 5) I suddenly pretend like I have somewhere to be so that I don’t feel bad that I’m not buying the product. Well, this sh*t is GOOD. So good, that I actually bought two bags upon for first sample. 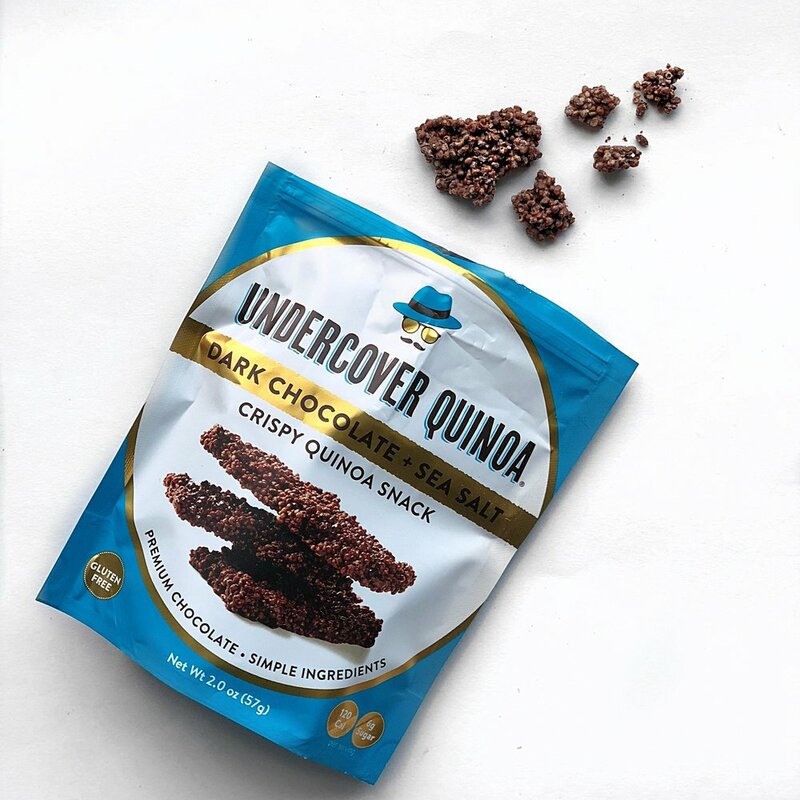 All that’s in dark chocolate Undercover Quinoa is QUINOA AND DARK CHOCOLATE. Crazy, I know. Two of my favorite things come together to make a delicious treat that is low in sugar. WHO KNEW? Available at whole foods in NYC and here. Kelly LeVeque is a holistic nutritionist and health expert whose nutrition philosophy is rooted in the science of human physiology. Instead of preaching a type of diet, Kelly speaks to bio-individuality (each individual is different in what foods work with their physiology) and eating to support our biochemistry. I think Kelly does an amazing job of taking the objective science of nutrition and making it accessible. I’ve been wild about stabilizing blood sugar (as I’m sure many of you know) after reading her book Body Love, and I’m sure you all will too. Follow Kelly on instagram @bewellbykelly and get Body Love here. It’s no secret that I love my Polaroid camera. My Instagram and blog posts are peppered with Polaroid pictures. There's something special about capturing moments with friends on tangible film to hang up or give out that iPhone pictures can’t compare to. Also, EVERYONE looks good on polaroid, it's a proven fact (okay, it’s not- but I’ve never had anyone disagree). Something about the exposure makes everyone look like a supermodel. They come in pretty pastel colors, are relatively inexpensive, and make GREAT gifts. Get yours here. I LOVE my rose water spray. So when I received this lavender water and glycerin spray made by the same company, I assumed Amazon botched my order. Only to then find out that my sister had ordered the lavender spray, and it had been delivered to my apartment instead of hers (we share a prime account)! Just two sisters and their sprays... in case there was any doubt, we’re related (watch the story unfold in my instagram highlights!). Being the nice older sister that I am, I kept the spray. Well, she did offer. And fell in love. Lavender is GREAT for healing skin blemishes. After using this spray for two weeks, my skin tone has been even and GLOWING. I swear this is the reason I haven't felt the need to wear any face makeup except a little concealer under my eyes. Needless to say, my sister is not getting this spray back. Get yours here. My friend Elizabeth from @sweatsandthecity put me on to the Think Dirty app, and I’ve been obsessed. Think Dirty has been a great way to learn about the potentially carcinogenic and toxic ingredients that could be lurking in my skin care and beauty products. All I have to do is type in the name of the product or scan the barcode. Think Dirty makes it easy to understand which ingredients are potentially harmful by providing a rating based off of factors like carcinogenicity, developmental and reproductive toxicity, and allergenicity & Immunotoxicity. Download the app in the app store and find out for yourself! Last Monday I stayed home sick and scoured Postmates to bring me some nourishment. I came across the tibetan mama rice bowl from Le Botaniste. 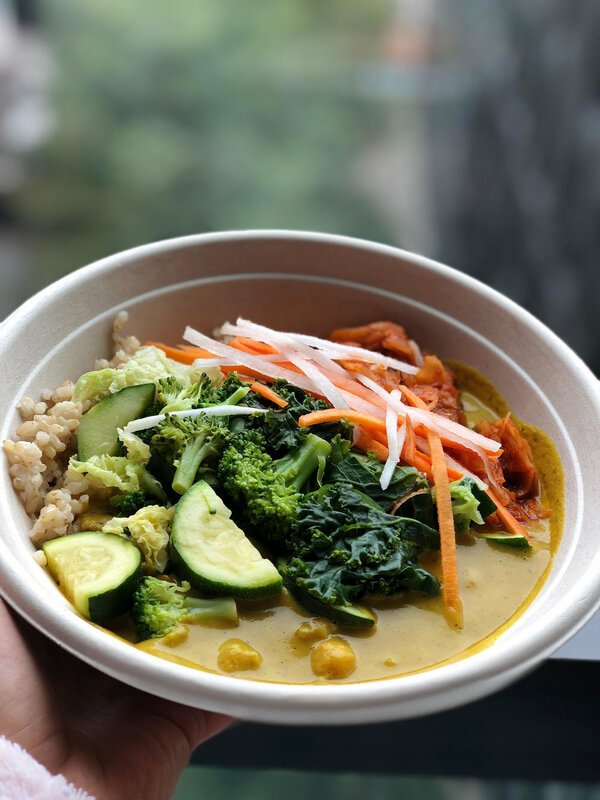 A vegan coconut curry with healing turmeric, veggies, topped with kimchi was JUST what the doctor ordered. Since then I have gotten the tibetan mama bowl two more times…. Obsession is putting it lightly. I made the mistake of getting the quinoa and peanut butter cookie the first time I ordered. It has since accompanied my mama bowl to my house on each occasion. Le Botaniste is a vegan and gluten free restaurant with locations in Soho and UES. Check them out for a nutritious and V delicious meal. Hope you love these people, places, and products as much as I do! If you are familiar with any of my favorites for this month, I would love to hear what you think in the comments below! The books that formed me.